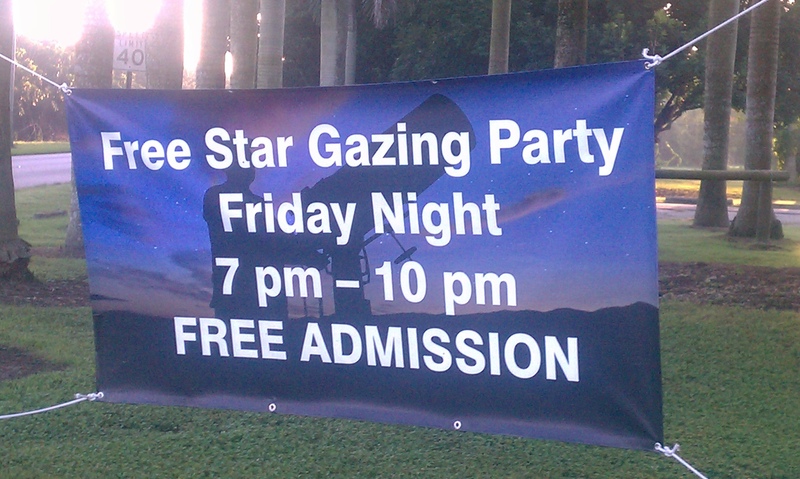 Stargazing Party in the Redland – FREE! Looking for something to do in Miami tonight and short on cash? Then head on out to the Redland’s Fruit & Spice Park for a free Stargazing Party from 7:00pm-10:00pm. The park is located in the heart of the Redland at SW 248 Street and SW 187 Avenue, aka Redland Road. Just take the Turnpike to 248 Street and head west. The Redland is quite a few miles away from the Florida Turnpike so don’t despair and think you’re lost. It’s approximately 7 miles from the highway so have patience. Once you pass US 1 there will be very few lights. Just watch for the stop signs every half mile or so and be cautious when crossing Krome Avenue (177 Ave.) At a certain time the cross lights are yellow so treat those as stop signs also. Stargazing in the Redland is particularly appropriate as the rural area without lots of streetlights lends itself to better viewing. I’ve not checked the weather yet but the view from my window tells me it looks like a sunny day. Hope the rain clouds stay away and provide clear skies for losing ourselves in the stars. This entry was posted on Friday, October 11th, 2013 at 9:57 am	and is filed under Pinecrest. You can follow any responses to this entry through the RSS 2.0 feed. Both comments and pings are currently closed.